Analysts are speculating that Apple may unleash a smaller and cheaper version of the relatively expensive iPhone that should be launched in the fourth quarter. The design of the iPhone could be based on its iPod nano music player. 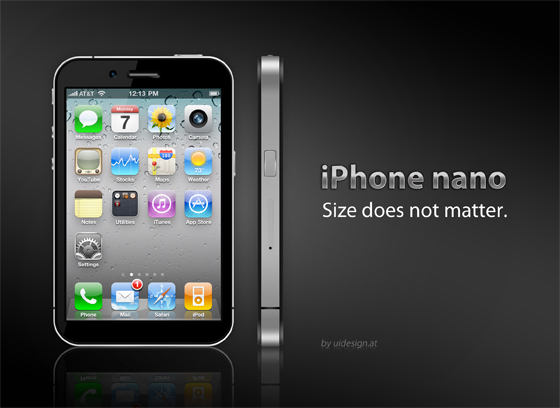 Currently a lot of mockups can be found showing concepts of Apples answer to Android. 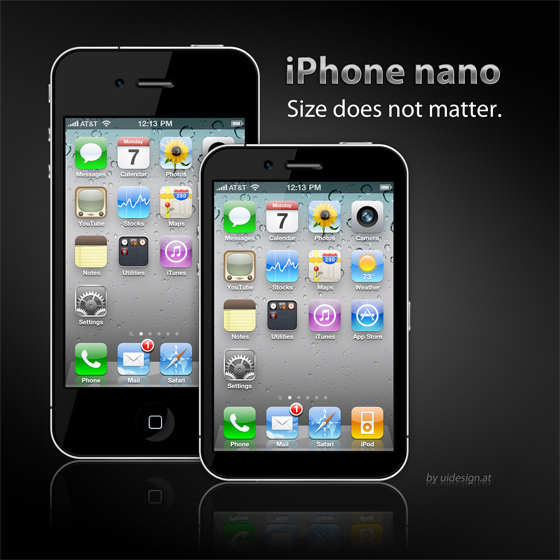 Impressed by some ideas I designed an iPhone nano mockup on my own. Basically I reduced the size of the screen and kept the home button as it is. Unlike some other rumors I don’t believe that Apple will abandon its main navigation element. The mockup also shows the multifunction sleep/wake button on top of the device and the volume buttons on the left side. There is still a front facing camera for e.g. video conferencing. Enjoy the result! This is my favorite version of the mockup. For better ergonomics I moved the home button up a bit. 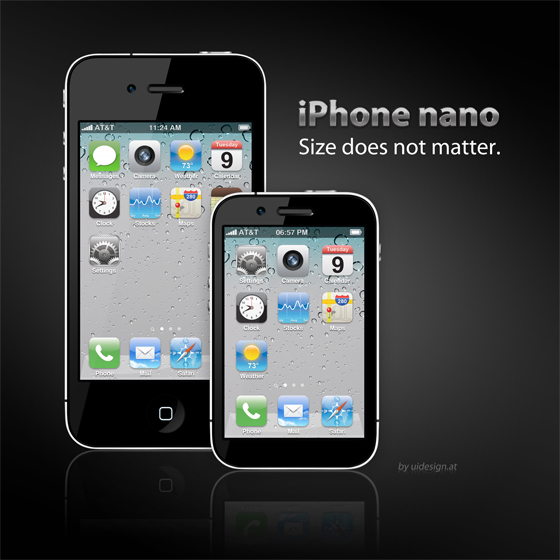 Additionally I created a side view of the iPhone nano, showing the home button and the SIM card slot. The new mockup shows the home button on the right side – here it’s a little bit bigger than in the previous mockup. Reducing the screen size and screen resolution is a serious issue, so I did not change it in Update 2 (this will also make life a lot easier for developers). I recently updated the mockup and designed a new one that considers the aspect ratio of the display. In the new mockup I moved the home button to the right side of the device. I think that could work! Inspiración: 5 Conceptos de iPhone | NoSoloSpam | Un Friki y Un Geek mal avenidos.